We've put together a tutorial which shows you how you can easily build an affordable Raspberry Pi Camera Robot that can be driven around using a web browser on a tablet, smart-phone or computer. All of the required software is provided as an SD card image, so it makes it really easy to get up and running with a cool robot quickly. 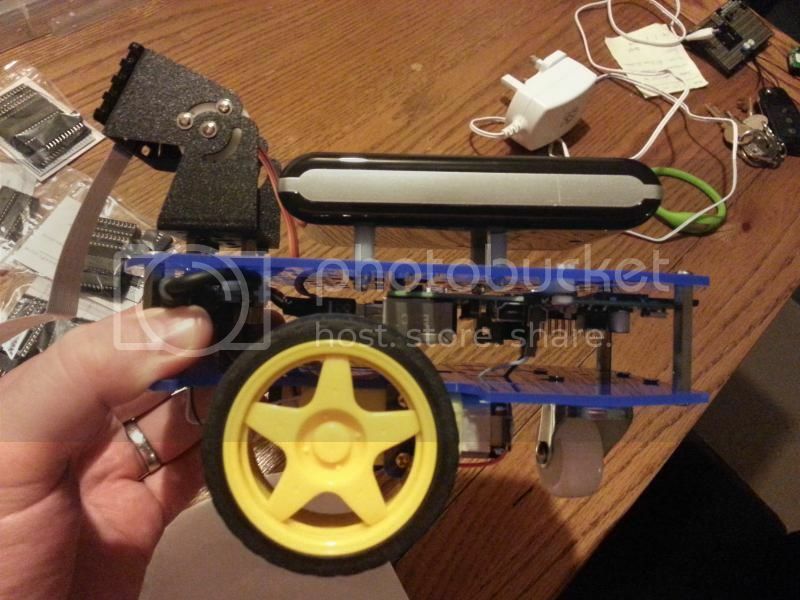 We also have a chassis bundle in our store which provides parts needed to build the robot. If you buy this bundle then it comes with wires soldered onto the motors, and connectors crimped onto all of the wires. So no soldering is required, you can just plug everything together and start having fun. Any comments or suggestions would be very much appreciated. Also, all of the software we wrote for the robot is open source and available here in case it's of use to people building their own Raspberry Pi robots. We've released an open source Python library that allows you to connect to the webserver running on the robot, and write scripts to give the robot autonomous behaviour. The scripts can run either on the robot, or on another, more powerful computer. The library lets you stream images from robot's camera for computer vision with OpenCV. We've also taken advantage of the clever work done at Pi towers to enable you to get motion vectors from the robot's camera (free low resolution optical flow! ). We've started to sell a USB powerbank that can be used to power the entire robot. This is more expensive than using rechargeable AA batteries, but gives longer running time (approx 3hrs compared with 1.5hrs for Duracell 2400mAh NiMh) and means that you don't have to buy a separate charger. As always, any questions, comments or suggestions much appreciated. Update 16/09/2014 - We've now expanded the kit slightly so that we run the Pi off a UBEC (efficient switching voltage regulator) rather than the Mini Driver's linear voltage regulator. This gives more current overhead for attaching sensors, and increases the robot's battery life to 3 hours when running off 6xAA NiMh batteries. Details of our battery testing process can be found in this blog post. Also, we've updated the robot's software so that it's really easy to attach lots of sensors to the robot and read from them using Python. The tutorial showing how to attach and read sensors can be found here. Last edited by abroun on Tue Sep 16, 2014 5:08 pm, edited 1 time in total. We've made a couple more updates (much improved battery life, and a tutorial showing how to attach lots of different sensors). We aim to keep improving the robot kit and the software over time, so if anyone has any suggestions for features they'd like to see in the future, we'd love to hear them. I've been having fun putting mine together over the last few weeks since getting one of these at CamJam, just doing a little bit here and there. I like how it is kind of 'ready to go' with the downloadable image and the interface already configured. Whilst I'm not normally keen on things that do all the hard work for you, I'm using this as something to get me started with robotics as I had avoided it so far as it looked a bit complicated. Having it all there working means I can go in and look at the code, change stuff, ask questions on motors, amps, current and all the other motor/robotics related stuff and learn as I go - rather than doing it from scratch and quickly losing interest because I'm so impatient The other thing I love, probably related to me having a few RC cars back in the day, is the way you can change the layout of the robot parts and use different power sources. Here's my current setup - I mounted the Pi and driver board upside down inside the two chassis plates - then broke into my powerbank, drilled some holes, and now have it properly mounted on top. I also removed the first servo so it's mainly front tilt view with the camera, and I'm going to use the other servo elsewhere on the robot once I can think up something cool...any ideas? Oh and I have a Tamiya TL-01 that I want to add my Pi to as a little project, maybe we can talk about how I can do this at PiWars?? I don't think I've ever seen anyone else assemble the kit in that way, but it certainly shows the flexibility of the chassis. I can't think of any massively functional uses for the servo, but you could give your robot a tail, and then wag it when the robot is 'happy'. Perhaps combine it with the camera and OpenCV to wag the tail when it sees someone's face? The Tamiya TL-01 looks interesting, looks like the throttle motor is a brushed DC motor so you should be able to connect this up to ML or MR on the mini driver, you could then attach the steering servo in place of either the pan or tilt servo. I'm gonna follow this setup to build my own, similar, I've got question regarding having uninterrupted power source. With powerbank, I assume you can either power mini driver and rpi separately (most powerbanks have few outs, the one I've ordered has two), or you could power mini driver and then rpi from 5V out of mini driver. My question is, can I have the rpi microUSB free so that I can power from mains at any time (say when developing when I don't need it to run around). That is - would it be safe to connect mini driver 5V to raspberry 5V (one of those GPIO pins), while having mini driver connected to powerbank?. I can plug whatever power source to the rpi 5V, but it is not safe as there is no protection. Is my assumption correct that here minidriver would already protect it? I am forever recommending one particular type of powerbank to people for powering their pi's on the go. BMS Doug wrote: I really like these, I've bought several. I don't have any commercial interest in these, they are just good. You can charge the powerbank while it is powering the pi. (you would need a 2nd battery for your motors). Bartosz wrote: With powerbank, I assume you can either power mini driver and rpi separately (most powerbanks have few outs, the one I've ordered has two), or you could power mini driver and then rpi from 5V out of mini driver. This is correct I think, provided that the powerbank output you use can provide enough current to drive both the Pi and the motors (this is about 1.5A). It also depends on the quality of your powerbank as I've found that whilst some can definitely provide the required current, they can't seem to handle quick changes in the current draw which can cause your Pi to brown-out. Bartosz wrote: My question is, can I have the rpi microUSB free so that I can power from mains at any time (say when developing when I don't need it to run around). That is - would it be safe to connect mini driver 5V to raspberry 5V (one of those GPIO pins), while having mini driver connected to powerbank?. I can plug whatever power source to the rpi 5V, but it is not safe as there is no protection. Is my assumption correct that here minidriver would already protect it? The way we originally powered this kit was to attach 6xAA rechargeable batteries to the mini driver, then run wires from the 5V and GND pins on the Mini Driver to the 5V and GND GPIO pins of the Pi. A GND wire was needed as there seemed to be high resistance in the USB cable. If you're running off AA batteries then this is the way to go, although you're limited by the 1A linear voltage regulator on the Mini Driver that actually seems to be closer to 0.8 or 0.9A. If you're using a USB powerbank then instead of using the regulated 5V line of the mini driver you can use the 'battery out' pin which is just right next to the power switch. You can see this in the mini driver manual, and it's where we attach the UBEC. Your Pi will still be safe as the powerbank contains a regulator (although it will fry if you later reattach 6xAA batteries), but you're not suffering any further voltage drop that may occur by going through the mini driver's regulator. Why not use a raspberry pi model A? It's less power consuming, cheaper and smaller. Pretty sure it needs 2 USB slots, hence no model A. It looks like the Arduino (compatible) is connected by USB, if you connected this to the GPIO instead (UART, SPI or i2c (which would need reprogramming of the arduino clone)) you would be able to use an A+. Do you know how many components can I connect to the Raspberry Pi A+? jeremy_fritz wrote: Do you know how many components can I connect to the Raspberry Pi A+? What sort of components? What current requirements? What function? OK. I will ask my question on a different thread. Is there anyone here that has completed the robot built and has instructions on how to do it? Since DawnRobotics has closed down I have no way of completing this project on my own. Can anyone please help?